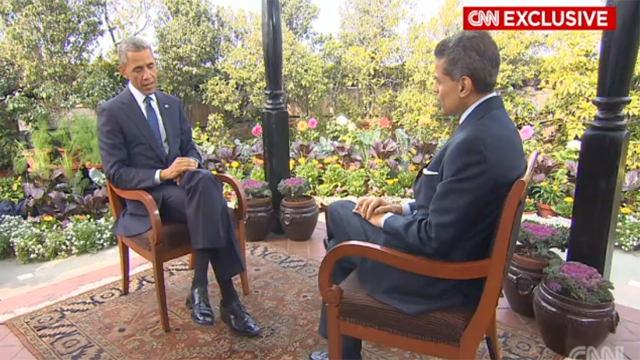 The following excerpt is from an interview between President Barack Obama and CNN’s Fareed Zakaria in New Delhi, India. The President spoke with Zakaria as he concluded his state visit to India and spoke about the passing of King Abdullah of Saudi Arabia for CNN’s NEW DAY. The full interview between Zakaria and the President will air inside CNN’s FAREED ZAKARIA GPS international affairs program on Sunday, February 1st on CNN/U.S. at 10:00am and 1:00pm and on CNN International at 7:00am. All times Eastern. FAREED ZAKARIA, Host of CNN’s FAREED ZAKARIA GPS: So when Americans think about Saudi Arabia and specifically, I think they find it almost incomprehensible; this is a place where a blogger is sentenced to 1,000 lashes for expressing his opinions, where women can’t drive, they can’t work without a male member of the family’s permission. What would you say to them if they asked, why are we so closely allied with this regime when we now out-produce it in oil? BARACK OBAMA, PRESIDENT OF THE UNITED STATES: Well, what we’d say to them is that it is important for us to take into account existing relationships, the existing alignments within a very complicated Middle East, to recognize that we have strategic interests in common with Saudi Arabia and that even as we work on those common interests, for example, countering terrorist organizations, that we are also encouraging them to move in new directions, not just for our sake but more importantly for their sake. OBAMA: — you know, I think on this visit, obviously, a lot of this is just paying respects to King Abdullah, who, in his own fashion, represented some modest reform efforts within the kingdom. But we have maintained a sustained dialogue with the Saudis and with all the other countries that we work with. What I’ve found effective is to apply steady, consistent pressure, even as we are getting business done that needs to get done. And oftentimes that makes some of our allies uncomfortable. It makes them frustrated. Sometimes we have to balance our need to speak to them about human rights issues with immediate concerns that we have in terms of countering terrorism or dealing with regional stability. OBAMA: But the trendline is one that I will sustain throughout the rest of my presidency and that is to make an argument to those friends and allies of ours that if they want a society that is going to be able to sustain itself in this age, then they’re going to have to change how they do business. And you know, some of them listen and some don’t. I remember a conversation I had two weeks before President Mubarak left, maybe three or four weeks, when the protests in Tahrir Square were first taking place. And I had a cordial relationship with Mubarak and he had been obviously very helpful with Israeli-Egyptian peace and had been very helpful to us in a whole bunch of ways. And if you can get out in front of reform, then you can be the father of the Egyptian democracy in a way that will put your name in the history books. So sometimes folks don’t listen. But I will keep on speaking to what I think not only I believe but what the vast majority of Americans believe. Advance segment transcript below includes sound on a drone that landed on the White House lawn to air on CNN and CNN.com later. ZAKARIA: Americans have been very interested to hear about this drone that landed in the White House, your back yard, where you and your family lives. But I’ve actually asked the FAA and a number of agencies to examine how are managing this new technology because the drone that landed in the White House you buy in Radio Shack. You know that there are companies like Amazon that are talking about using small drones to deliver packages. This is — there are incredibly useful functions that these drones can play in terms of farmers who are managing crops and conservationists who want to take stock of wildlife. And so there are a whole range of things we can do with it. But we don’t really have any kind of regulatory structure at all for it. So I’ve assigned some of the relevant agencies to start talking to stakeholders and figure out how we’re going to put an architecture in place that makes sure that these things aren’t dangerous and that they’re not violating people’s privacy. And you know, in some ways, Fareed, this is similar to what’s happened in cyberspace. These technologies that we’re developing have the capacity to empower individuals in ways that we couldn’t even imagine 10-15 years ago.